If you are the kind of person who likes hyperkinetic postmodern fiction, artsy indie games, or both, you will almost certainly enjoy “The Stanley Parable” by Galactic Cafe, a recently released expanded, standalone version of a mod for Valve’s Source engine that originally came out in 2011. You should also read as little about it as possible — this column included — before playing it. Some spoilers lie ahead, and my enjoyment of the game was certainly enhanced by the fact that I had no idea what the hell I was getting into before I booted it up for the first time. So, the basics: Stanley is a man who works in a large office. He sits at a computer every day and fulfills “orders,” meaning messages pop up on his screen telling him to hit a letter on his keyboard, and he does so, over and over and over. Despite the unfathomably boring and monotonous nature of his work, Stanley is happy — until one day the orders stop coming in and he notices all his co-workers are gone. The game starts with a British narrator explaining all this, with Stanley emerging from his windowless office to see what’s going on. What follows can only be described as a postmodern literary funhouse. This may sound like unnecessarily elevated language since we’re dealing with a video game, after all, but it’s apt given the many ways “The Stanley Parable” gleefully, wonderfully violates basic rules of narrative structure and game design. The game is, above all, about the concept of choice and the many ways it can be corrupted or rendered meaningless, and this concept is channeled beautifully through the tension that exists between the narrator, Stanley (who remains silent), and you, the player. It quickly becomes clear that what the narrator wants may not be what Stanley wants and may not be what you want — that the three actors in this story often have conflicting goals. The narrator, who is the only one who gets to explain himself explicitly to the others and who has the most control over the proceedings, has a very clear idea of what this story is about and where it’s going, and when Stanley does as he’s told, the narrator addresses him from a respectfully distant third-person perspective. It’s when you (I’m going to use “you” and “Stanley” interchangeably from now on to forestall clunky writing, even though there are parts of the game where the distinction matters greatly) fail to heed the narrator’s dictates, however, that things get a bit heated, and frequently bizarre. Like, for instance, if you hurl yourself off of a ledge instead of stepping safely onto a lift. “But in his eagerness to prove that he is in control of the story and no one gets to tell him what to do, Stanley leapt from the platform and plunged to his death,” says the narrator. “Good job, Stanley — everyone thinks you are very powerful.” It’s one of the many times he will gleefully mock or challenge you (he’s voiced by the actor Kevan Brighting, whose excellent performance reminded me of some of the best moments from the “Portal” games, both of which featured hilariously unhinged voices commanding you to do things). Then the game restarts, which happens a lot. When you die. When you “win.” When the narrator decides, for one reason or another, that things need to be restarted. During the game’s many bizarre “endings,” in some of which the action flew so far through the looking glass that all I could do was pick my jaw up off the floor and giggle childishly, it became clear that this isn’t your standard narrator. He has needs too, you know, and insecurities with regard to his relationship with Stanley and his ability to dictate the story on his own terms. The problem is, there’s nothing to do. You just stand there gawking at the beauty. Sure, the narrator might be happy, but is Stanley? Is the player? 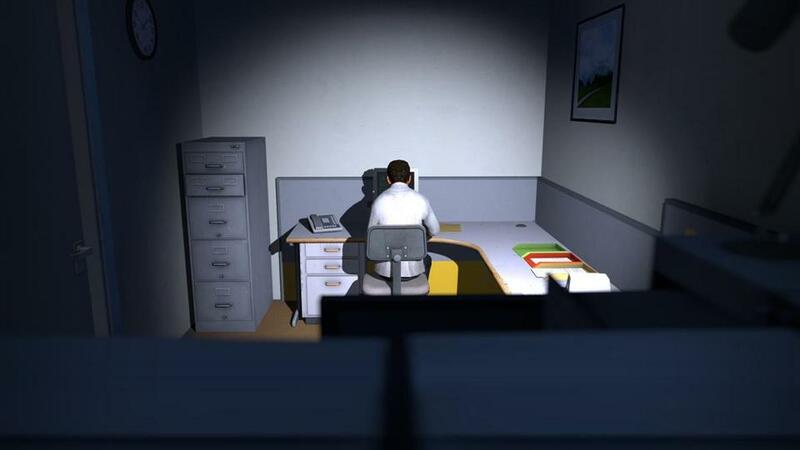 ‘The Stanley Parable’ gleefully, wonderfully violates basic rules of narrative structure and game design. It’s a remarkable sequence that stuck with me. The narrator’s pleading made it feel like I was making a serious choice in climbing up to the top of that platform four times, even though I knew it would simply lead to a restart. In short, the moment stacked up well with some of my favorite fiction. Not something I can say about 99.99 percent of the games I play. “The Stanley Parable” is more than a game, though. It really is.